I enjoyed my first trip to Romney and hope there will be more. As is often the case in the great Northeast, ignoring the dire forecast proved to be worthwhile as we enjoyed some fantastic riding and not much rain. Of course, staying in a motel makes the decision easier. There was talk of changing the dates for next year but nothing said yet. I liked the timing myself and the odds of yet another wet weekend are pretty low. However, I can understand wanting to move to a date that may be drier. Even so, I support the existing time frame given the verdant springtime and moderate temperatures. 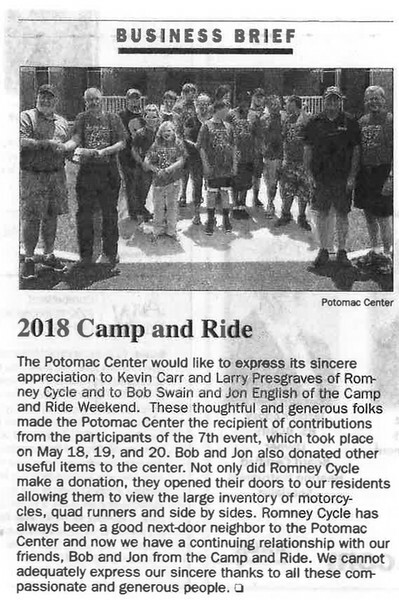 A note to all of our participants from The Potomac Center. This picture will appear in the newspapers in Romney, Keyser, Cumberland and Moorefield. I can't thank all of you appropriately for your compassion and generosity toward our kids and our programs. Here's looking forward to next years weekend with hopes of dry weather! Here's one of the clippings. Feel free to replace your name when you see Bob and Jon. We're happy to stand in to represent all of you who make this donation possible. It's not the two of us, it's all 58 of us this year. 58?....yes, I'm counting the people I know about who weren't there but made substantial donations. Thanks to everyone who participated. Rudderfeet and K9 Wee like this.